The "Universum Champions Night" on July 14 at the huge Color Line Arena in Hamburg features a highly charged WBO world heavyweight title eliminator between Luan "The Lion" Krasniqi (30-2-1, 14 KOs) and Tony "The Tiger" Thompson (29-1, 17 KOs). Both fighters spoke during today's pre-fight press conference at the Hamburg CinemaxX. 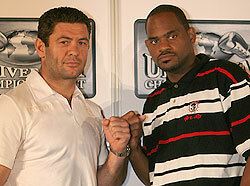 "A dangerous opponent awaits me," commented Krasniqi. "He's not the fastest, but he has an awkward style to box against. However when I climb into the ring I'll be fully prepared to work hard for a victory bit by bit. My preparation was very good. I had a super last day of sparring. All of my sparring partners used the fight style of Thompson so that I could fine-tune for him very well. For me, this fight is important above all else - I will not let this world championship chance slip away. I'm concentrating only upon the day of the fight and I won't make a mistake by looking ahead at a world championship fight." Thompson, when confronted about his highly publicized prefight promise to 'kick his a-- and bring it to his after-party,' responded, "That was written a lot in the press. All I'll say is that I have prepared myself very well for this fight with my team and the result on Saturday will be in the ring and not the media. It will be an interesting and exciting fight."